One of the biggest advantages of slate tiles is that they are fireproof and heat resistant thus not easily destroyed by the heat from the cooking appliances. Installing the slate tile backsplash near the cooking area therefore guarantees that you remain safe and your wall is not affected by the high temperatures during the cooking process. Slate also comes in a number of earth stones in various colors including beige, grey, green, blue, purple and red among others. Depending with your color preference, you can use the slate backsplash pictures to choose the best color combinations with your other decorations in mind. The slate tiles are also ideal in that they offer you original designs owing to the fact that no two rocks can be said to be identical. Slate backsplash can be relied on when it comes to attractiveness and easy designing. The different slate backsplash designs will definitely give you the natural look on your wall thus enhancing the aesthetic appeal in your kitchen. 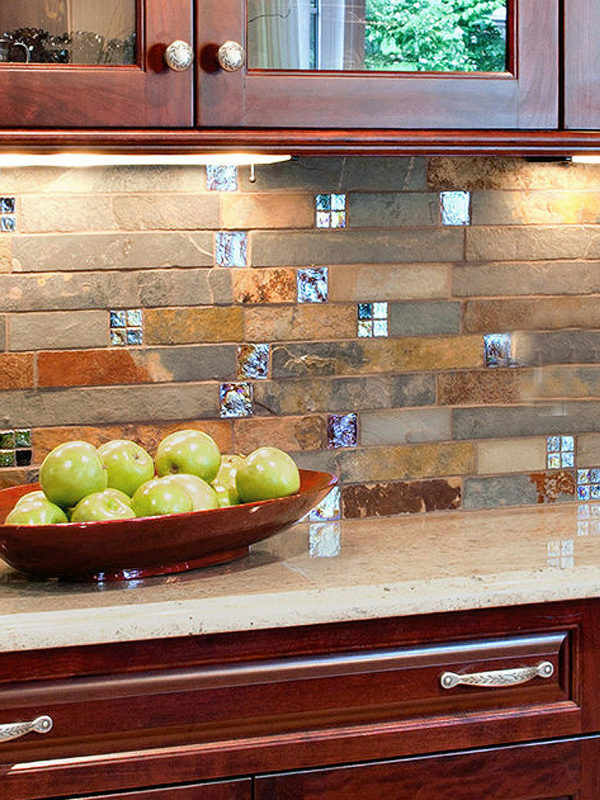 From different slate backsplash pictures, it is easy to pick out a good design idea to use in your own remodeling plan. For example you can go for slate backsplash tiles that are almost matching in colors to come up with a monochromatic backsplash. This can also be done by adding some accent tiles in a pallid color to give the backsplash a boost. There are lots of designs that can be created using the slate tiles and there is no limitation on what you can achieve. In fact it is very easy to combine the slate tile colors with your cabinets and floor tiles perfectly thus getting the design that is appealing. A kitchen with a bucolic décor can be enhanced by selecting some jugged slate tiles that will help you come up with a fascinating design. Combining different designs as seen in the slate backsplash pictures can help transform any kitchen from a dull room to a gorgeous place where people will feel comfortable to relax and work in. you can use different textures and sizes of slate tiles giving your kitchen an outdoor feeling. Working with an experienced remodeling designer could be helpful throughout the process for superior results. This entry was posted in SLATE, TUMBLED HONED. Bookmark the permalink.